Phillip's street atlases show every street in England, Wales and most of Scotland. These detailed, comprehensive and highly successful street atlases are ideal for motoring, business and leisure use. They are widely used by the emergency services, professional drivers and local authorities throughout Britain. 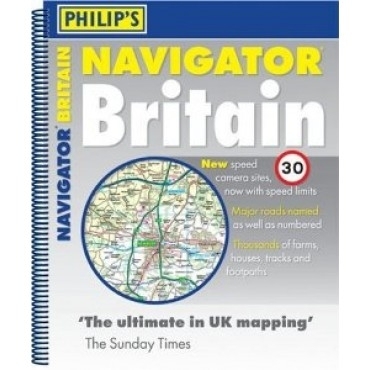 There are currently 70 titles in the Street Atlas series, all containing mapping based on the latest authoritative data from Ordnance Survey and enhanced to PhilipÕs exacting specifications. Each atlas is available in a handy spiral-bound format and provides complete regional coverage at extra-large scales. The mapping is at a scale of 3 inches to 1 mile and features every named road, street and lane, with time-saving through routes highlighted in urban areas. Schools, colleges, public buildings, sports and leisure facilities, hospitals, police stations, railway stations, industrial estates and shopping centres as well as rural features such as woods, farms, hills, rivers, landmarks are marked and named. Each atlas includes a comprehensive index complete with postcodes.